As with almost all farmed animals, kampachi are subject to small external pests – in this case, the skin fluke that attaches itself to the fish’s skin. These flukes do not pose any risk to human health. They also do not detract from the quality of the harvested product. However, they may cause irritation to the fish. Proliferation of skin flukes in the net pen may also lead to increases in parasite prevalence in wild fish. It should be noted that in prior studies, the skin flukes on farmed kampachi in offshore net pens did not have any impact on wild fish populations. This species of skin fluke is common on our fish in the spring and fall seasons, when the water temperature is between 23oC and 28oC, and is less prevalent in summer and winter, when temperatures are outside of these ranges. We monitor the abundance of skin flukes on our farm site, with an eye to both optimizing fish health and welfare in the pens, and reducing potential risks for transmission to wild fish. We share the data on skin fluke prevalence publicly, because we are required to do so under the Aquaculture Stewardship Council certification standards (see Certifications page), and because we believe that a transparent approach is important both for our customers and our community. The current prevalence of skin flukes on the farm site is 34.7 per fish. 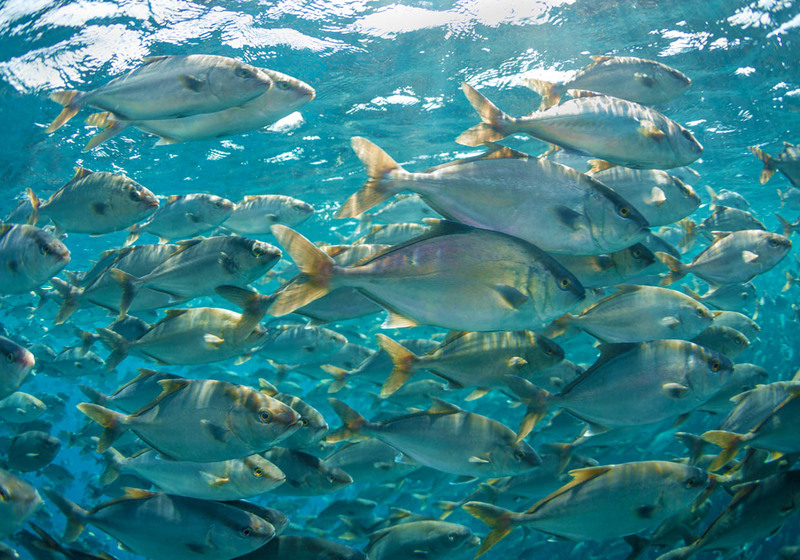 Kampachi (Seriola rivoliana) is distributed throughout the warm waters of the world, and is native to the Sea of Cortez. On our offshore farm site, we ensure that we have robust net pen construction, copper-alloy metal mesh netting, and constant vigilance for maintenance. However, in spite of our best efforts, there is always a possibility of some fish escaping. This is a problem for us as fish farmers, and it is also something to be avoided because of the potential genetic impacts, or the impacts on wild ecosystems. We use only wild-caught or F1 (first generation) broodstock to ensure that there is no significant difference between the King Kampachi inside the net pen and the wild fish outside in the Sea of Cortez. Any fish that have escaped from our net pens, from breaches in the nursery netting, are invariably subjected to very heavy predation pressure. The long-term prospects for survival and reproductive success of any escapees are unknown. However, there is little likelihood of escapees competing in any significant manner with the wild stocks of snapper or other high value species targeted by local fishermen. We report all of our escape events, and undergo rigorous analysis of the root cause, so that we can prevent future escapes. We share our escape reports here publicly because we are required to do so under the Aquaculture Stewardship Council certification standards (see Certifications page), and because we strongly believe that a transparent approach is important both for our customers and our community.